As part of our ongoing efforts to serve you, we are happy to announce our new Owners Portal feature. With the Owners Portal you will have the ability to access current and historical Owner Packets and download these reports on demand in PDF format. This gives you anytime, anywhere access to the same Owner Packets you receive on a monthly basis. 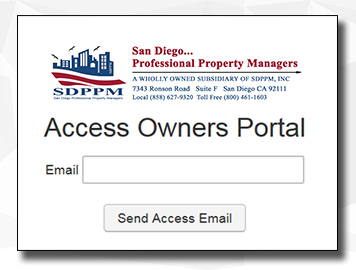 If you are a current Owner and have already set up your Owner Online Portal, click here to access the login in screen. Open an internet browser and go to: https://sdppm.appfolio.com/oportal. Enter your email address and click Send Access Email. Go to your email program and click the link in the email you receive from us. When you click the link, you'll be signed into your secure Owners Portal and have access to your reports. Once you are signed into your secure Owners Portal, you will see this screen. You will have access to your current owner packet and older owner packets. To access your current Owner Packet, click on Download Owner Packet. To access past reports, click on the link "click to show older packets.